Back in February 2014 I wrote about the Przewalski’s horses in Woburn Safari Park (Bedfordshire, UK). Last weekend, I went back to visit them again. Przewalski’s (see note below) horses are the last surviving subspecies of wild horse. They’re the real thing. These horses used to roam the steppe or treeless grasslands along the Mongolian border with China. Because of hunting and the disappearance of their habitat as humans spread out across the steppes, these wild horses very nearly became extinct. Some Przewalski’s horses were kept safe and bred in captivity – but not domesticated. Today there are still only about 1,500, mostly in zoos though a few have been re-introduced back into Mongolia. Woburn has a small herd of five. Other horses sometimes described as wild are actually descended from escaped or released domesticated horses, eg mustangs in America, brumbies in Australia. They’ve generally got a hint of their Arab or Spanish ancestors’ graceful looks. The appearance of a Przewalski horse, by contrast, is fine-tuned for survival. This one has his summer coat. So you’ll see that, compared with the domesticated horse, a Przewalski horse has a shorter, more muscular body. His plain colouring is designed to camouflage him and his mane sticks up. His shape is more like that of a Zebra (they’ve also got Zebras at Woburn) and like Zebras Przewalskis determinedly resist taming and have to be sedated for any hoof trimming etc. Ever wondered what a wild horse would look like? Or how it would behave? One descended from a complete line of wild, undomesticated horses? I’ve been fortunate enough see those in Woburn Safari Park (about 50 miles north of London, UK) and even more fortunate to be able to interview an animal keeper at Woburn Safari Park who knows them well. The other horses or ponies you think of today as wild are actually descended from escaped or released domesticated horses. This includes the mustangs of America, the brumbies of Australia, the “wild” horses of Namibia and so on. Free-roaming ponies such as those in the UK’s New Forest or on Dartmoor are all owned and protected in various ways. New Forest ponies for example are regularly rounded up, given a health check and even have their tails cut to indicate what where their owners are from. Przewalski’s horses, though, are the last surviving subspecies of wild horse. They’re the real thing. The first person to write about them scientifically was a 19th century Russian explorer named – yes, you guessed it – Przewalski. These horses used to roam the steppe (treeless grasslands) along the Mongolian border with China. Gradually though because of hunting and the disappearance of their habitat with the spread of humans across the steppes their numbers dwindled. They became very nearly extinct. Still, some Przewalski’s horses were kept safe and bred in captivity – but not domesticated. Today there are about 1,500 of them, mostly in zoos though some have been re-introduced back into Mongolia and China. Compared with the usual, domesticated, horse Przewalski’s horses have a shorter, more muscular body and they’re smaller (about 12 to 14 hands high). They have a pale belly and beige to reddish-brown coat. They have a striking dark mane that sticks up. Here’s a picture of the ones in Woburn. Animal keeper Tom Robson’s job includes looking after Woburn’s Przewalski’s horses – when he’s not tending to the giraffes, rhinos and zebras. He told me they’ve got six Przewalski’s horses: two mares and four geldings. They are part of the international breeding programme to keep the breed alive. They stick together as a small herd, with one more dominant male. 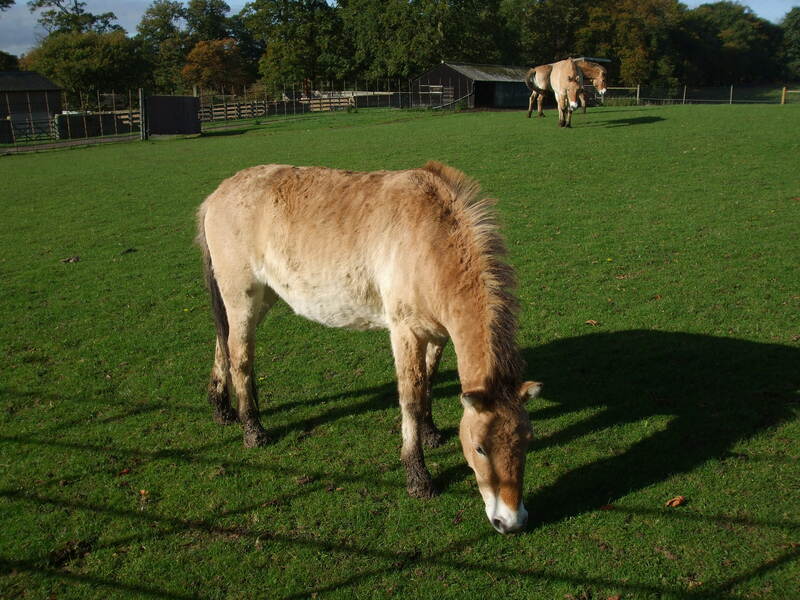 The care of these horses is similar to that of rugged native UK breeds – in Woburn they’re kept on grass with a hard-standing area (which helps keep their hooves sound) with supplemental hay, chaff and pasture nuts provided when necessary and they have access to shelters. Like American mustangs, they’re very sensitive about their hooves. Like most herbivores, their main preoccupation is eating but Tom has seen them playing the occasional chasing game. A snippet from Woburn that tickled me is that the keepers give the horses’ hoof trimmings to the wolves – who just love to roll on them. So, overall, Przewalski’s horses are similar in many ways to domestic and free-roaming horses but they certainly look a bit different. While I was in Woburn Safari Park, I heard a Dad confidently telling his small son that they were “donkeys with small ears”. What do you think? Book marketing tip – Audiobooks: next big phenomenon after e-books? Want to reduce your stress – but how? colouring-in? horses?